- Take equal quantity of honey, ginger juice, and finely powdered cumin (jeera) seeds, approx 2-3 tablespoon, and make a mixture. Take this mixture 2-3 tablespoon twice a day. This is an effective home remedy for high blood pressure. - Gooseberry (amla) is also used in the treatment of high blood pressure. Take 1-2 tablespoon of amla juice with honey in empty stomach early in the morning. It will help in lowering high blood pressure. - Patient suffering from high blood pressure should take a spoonful of lemon juice mixed with honey every morning. - Take 2-3 tablespoon onion juice and mix honey (2-3 tablespoon) to it. Take this mixture for lowering high blood pressure. - Take 1-2 tablespoon of fenugreek (methi) seeds and boil in a glass of water. Strain and then take this mixture. 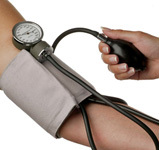 This is very effective home remedy for the treatment of high blood pressure. Patient may take this drink for 2-3 months twice a day. - Curry leaves are also commonly used in the treatment of high blood pressure. Take 35-40 green curry leaves and boil in a glass of water. Keep it aside and allow it to cool. Drink this solution in empty stomach in early morning. - Take dry water melon seeds and make its powder form. This powder can be taken 1-2 tablespoon in a glass of water. - Carrot and spinach are also helpful in reducing high blood pressure. Extract fresh juice from carrot and spinach and drink a glass of it twice a day. - Alfalfa is a very useful herb for lowering high blood pressure. It contains several elements that are needed in the softening of the hard arteries. This reduces the tension in the arteries and hence helps to treat hypertension. - Garlic is an antispasmodic agent and helps in reducing the pressure in the arteries caused due to the pumping action of the heart during blood circulation. It creates a rhythm in the pumping of the heart, which eases the pulse. It is an effective herbal remedy for high blood pressure. - Another useful herb for treating high blood pressure is Jaundice berry. It eases the tension in the arteries by making them dilate. Thus the blood flow in them is facilitated. - Parsley regulates the flow of blood in the blood vessels and maintains easy circulation. It looks after the entire arterial system. It is a very useful herb for high blood pressure.